Staff in Higher Education 2013/14 shows that there were 194,245 academic staff employed at UK higher education providers (HEPs) on 1 December 2013 and 201,535 non-academic staff. 45% of academic staff were female, but at senior levels women made up 22% of professors, and 33% of other senior academic staff. The majority (63%) of non-academic staff in 2013/14 were women, including 54% of managerial, professional and technical staff and 82% of clerical staff. The HESA Staff record changed in 2012/13 so that earlier definitions of Professor are not strictly comparable with recent data. However in 2003/04 only 15% of academic staff graded 'Professor' were female, and the trend shows this proportion increasing slowly over time. 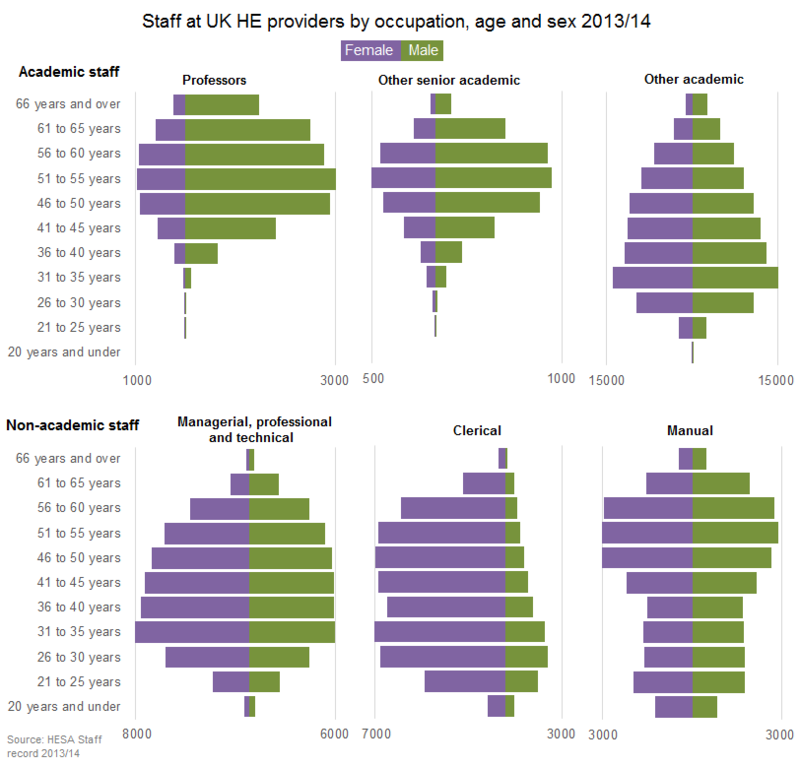 Staff in Higher Education 2013/14 is a downloadable publication which includes comprehensive data on HE staff broken down by demographic and contract characteristics. Staff in Higher Education 2013/14 is available to purchase now. The introduction to the publication is published online and includes further graphs and data tables. The next scheduled release from HESA will be the publication of finance statistics on 5 March. A schedule of HESA releases for 2015 can be found here. HESA staff data is collected from all publicly funded higher education (HE) providers in the UK, plus the University of Buckingham, which is a non-publicly-funded HE provider. The 2013/14 data covers 162 HE providers (131 in England, 9 in Wales, 18 in Scotland and 4 in Northern Ireland). More data on HE staff can be found in our Online Data Tables page, the publication introduction, and the HESA blog.